Auto companies make a lot of promises about their products. Promises about performance, value, quality, utility, prestige, even whether a particular car will help you get lucky. Sometimes they keep their promises, and sometimes they don’t, in which case the enthusiast populace often shrugs its collective shoulders and moves on. But such is not the case for the Miata. This is a car that, as far as people like us are concerned, was in the beginning, is now, and ever shall be pure and simple and an absolute joy to drive. Mazda stayed the course for the second generation, but will it continue to build a product that defines what a lightweight sports car should be? So far, it looks as if it will. The third-generation Mazda MX-5 Miata is being shown publicly for the first time at the Geneva auto show as you read this, just a few months after we were given an advance look at final styling and engineering prototypes at Mazda headquarters in Hiroshima, Japan. We haven’t yet driven the new roadster, but we’ve sat behind the wheel and gleaned key design and technical details. 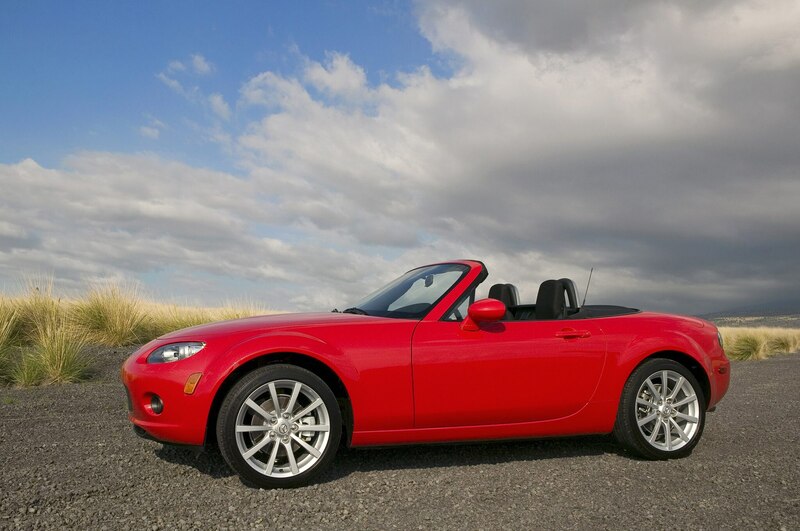 Whether the new 2006 Mazda MX-5 Miata is as handsome as the outgoing car is a matter of personal opinion, and you can form yours by examining these pictures, which were provided by Mazda. We can report, though, that in a design studio full of jaded scribes, there was a palpable sense of occasion in the air as we awaited the new roadster’s unveiling. But when the drape was lifted from the car, hands that had been raised in anticipation of applause fell to journalists’ laps as a deathly silence pervaded the room. “Perhaps your first impression is that it looks like the current car,” offered design chief Yasushi Nakamuta. “That would be a compliment to me, because our intention was to retain the current car’s looks.” Well, yes and no. There’s no question that it’s an MX-5, but it’s one that perhaps has sprouted tumorous growths around the wheel wells. You can call these bits of bulging sheetmetal many things-muscular, athletic, sporty, sinewy-and indeed they are impressively complex in form, with three distinct surfaces adjoining the quarter-panels themselves. But we would call them incongruous. The overall effect is of a Miata that accidentally wandered onto the RX-8 production line. Mazda design studios in North America, Europe, and Hiroshima contributed to the new MX-5, and it’s obvious that they were all attempting to imbue the roadster with some Mazda-family design cues. 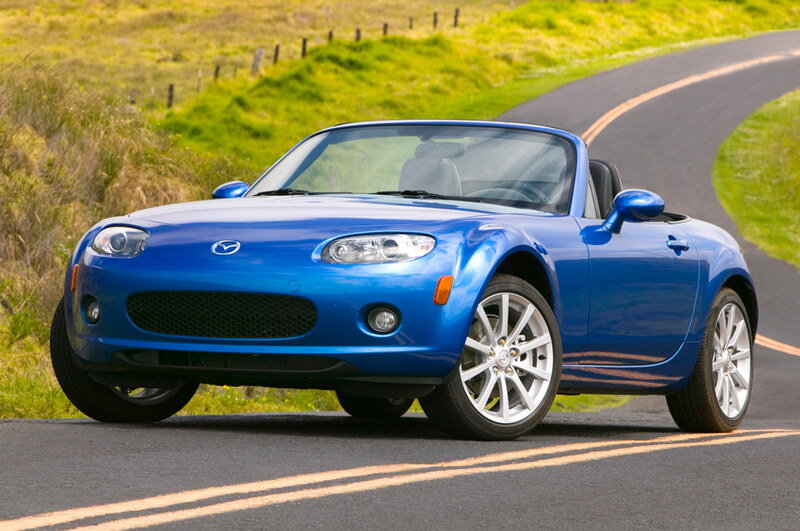 As everyone in Hollywood knows, sequels can be dicey, but Mazda proved with the second generation that the Miata formula has legs for the long haul. For the third generation, Mazda designers, engineers, and product planners reembraced the now-famous jinba ittai spiritual theme that produced the original, seminal car. Taken literally, jinba ittai means “rider and horse as one,” and it refers specifically to the relationship between an archer and his steed. 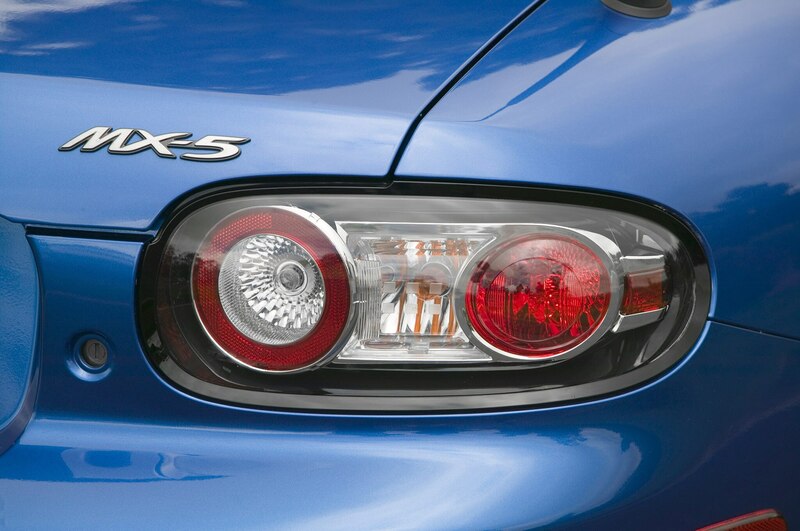 For Mazda’s purposes, MX-5 program manager Takao Kijima describes it as “a warm, flesh-and-blood interface . . . a oneness, a tension” between the roadster and its driver. “Like the archer on horseback, we are looking for a similar relationship, a mutual communication, between driver and vehicle.” Anyone who has ever driven a Miata knows exactly what he is talking about. 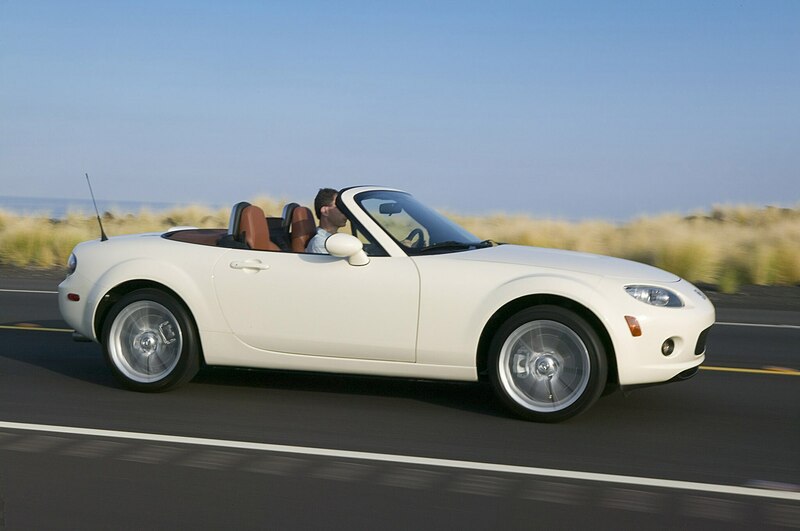 During the media presentation, Mazda mentioned the Porsche 911, the MINI Cooper, and the Volkswagen New Beetle in the context of “keeping concept evolution,” the clear implication being that it is doing exactly that with the 2006 Mazda MX-5 Miata. Knowing from the start that the new Miata would not be morphing into some sort of Toyota Camry Solara convertible, Kijima and his crew set about the difficult task of retaining the roadster’s lightness, simplicity, and purity of purpose-all that jinba ittai stuff-while increasing engine displacement, introducing the latest safety equipment, and carving out more interior room, yet keeping size and weight similar to the current car’s. The basic layout — a front/midship engine location driving the rear wheels — continues. The engine, transmission, and differential are linked by an aluminum beam and a stiff driveshaft to sharpen throttle response. As previewed by the 2003 Tokyo show Ibuki concept, the engine itself has been moved rearward by 5.3 inches to reduce the yaw inertia and achieve near 50/50 front-to-rear weight distribution. Naturally, all-independent suspension returns, with control arms at the front and a multilink setup at the rear. (It’s amusing to consider the indignant outcry that would result if Mazda got cheap and went with a live rear axle.) 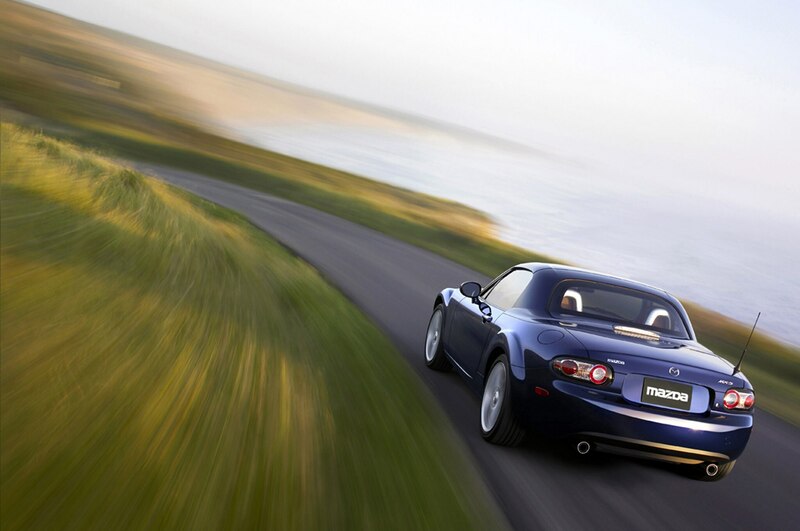 As before, a light but stiff unibody forms the foundation for the Miata’s natural, nimble dynamic character. 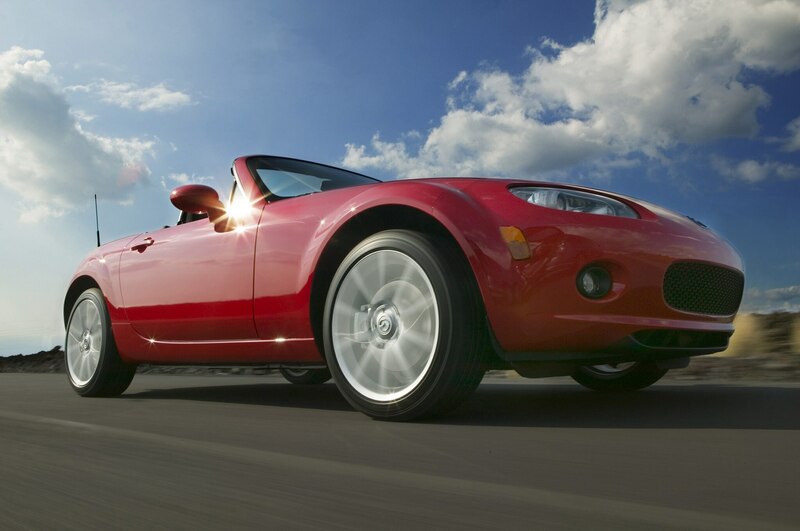 Per Miata tradition, engineers paid particular attention to harmonizing steering, suspension, braking, engine, and transmission responses into a coherent whole. The front track was increased by three inches, and available footwear has grown to seventeen inches in diameter. Underhood, the strut-tower brace now is triangulated, linking up to the fire wall for additional torsional stiffness. The front frame rails, the roll-bar structure, the A-pillars, and the underfloor and rocker panels are composed of ultrahigh-strength steel, while the center spine, the frame rails near the fire wall, the rear wheel wells, the rear fire wall, and the door openings use high-strength steel. The result is a unibody that is 22 percent stiffer in bending and 47 percent stiffer in torsion compared with the current MX-5. The first and second MX-5 generations were Coke-bottle-shaped, but the new car, when viewed from above, forms more of an oval, with narrower front and rear sections but extended shoulders, an architecture that also was previewed by the Ibuki. In real terms, this results in more hip, shoulder, and elbow room, as the new car is about an inch and a half longer and wider and half an inch taller, with a wheelbase that is 2.6 inches longer. Bigger usually means heavier, but R&D chief Joe Bakaj promises that the new roadster is “within 22 pounds of the current car,” which weighs about 2440 pounds. Any opportunities to trim excess avoirdupois, no matter how minute, were seized, including using aluminum for the hood, trunk lid, various suspension components, and rear brake calipers, plus composite plastics for the intake manifold and camshaft cover. The power steering pump and the air-conditioning compressor are mounted directly to the aluminum engine block, saving the need for seven pounds’ worth of separate brackets. A hollow tube in place of a solid rod for the front anti-roll bar saves another five pounds. And so on. So painstaking were Mazda engineers’ efforts to save weight that drivers and passengers might feel obliged to go on a crash diet before driving the MX-5, lest they negate all the clever weight-loss engineering with their own bloated bodies. If you were hoping for a rotary in the new roadster, you will be disappointed, but we think Mazda is wise to reserve that idiosyncratic, gas-guzzling, oil-consuming engine for the RX-8. Instead, we get a new 2.0-liter, DOHC four-cylinder in place of the previous 1.8-liter engine, a choice of five-speed or six-speed manual transmissions, and the option of a six-speed automatic with steering-wheel-mounted paddles. 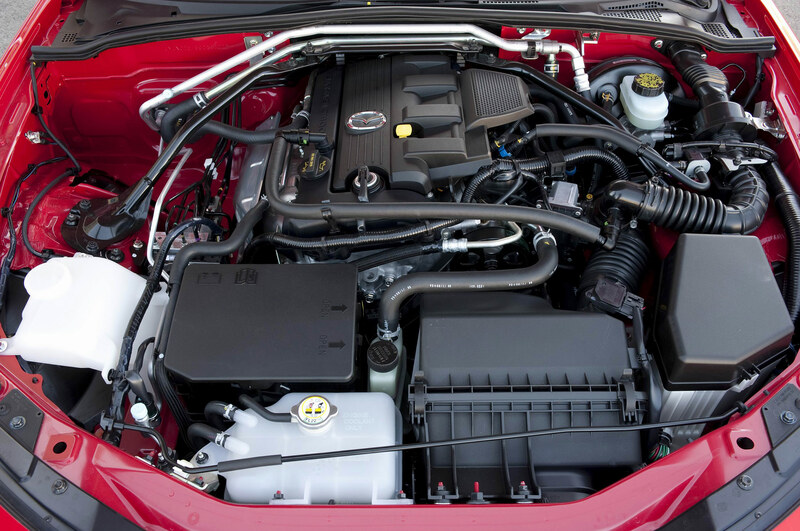 With a 10.8:1 compression ratio, variable intake valve timing, electronic throttle control, and a high, flat torque curve, this unit produces 170 hp — the same as the upcoming Pontiac Solstice — at 6700 rpm and 136 lb-ft of torque at 5000 rpm, compared with 142 hp at 7000 rpm and 125 lb-ft at 5000 rpm in the current car. The engine is slanted 10 degrees to accommodate a large, dual-mode intake manifold. Powertrain engineer Tetsuo Fujitomi boasts that the new engine will, above all, be livelier and more linear, with “constant acceleration feel and powerful, torqueful, smooth response.” As before, MX-5 engineers carefully tuned the engine and exhaust for optimal sound characteristics, concentrating on smoothness at lower rpm and rising to a more resonant, sporty song as the engine races to its 6700-rpm redline. More tangible improvements to the cabin include, for the first time, side air bags; standard chrome-ringed roll bars; lower air vents directed at waist level; optional smart-key access; and an all-new center instrument stack. 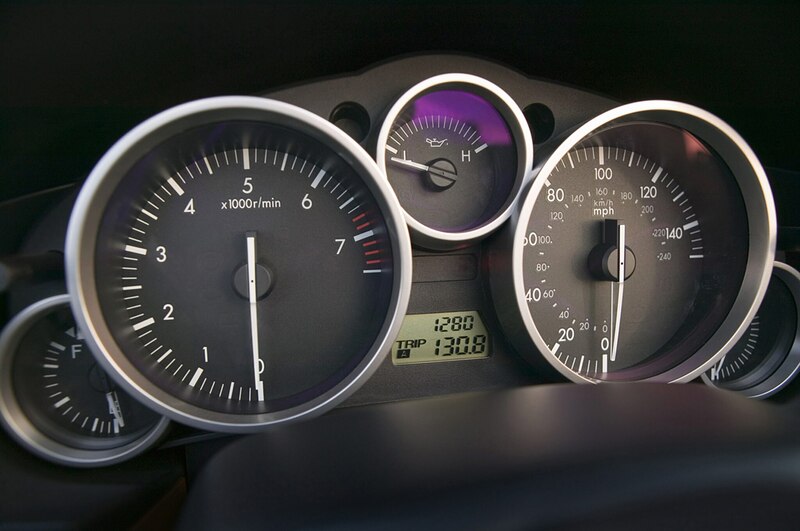 The fuel and temperature gauges, previously separate spheres, now tuck up against the predominant tachometer and speedometer in the main instrument panel, and there’s a new, three-spoke, tilt-adjustable steering wheel. The new MX-5 also offers more room for the stuff we like to bring along for the ride, including cup holders in the doors under the grab handles; a marginally bigger trunk, with optional run-flat tires eliminating the need for a spare; a lockable storage niche ideal for CDs between the seatbacks; additional bins behind the seats; several net pockets; covered cup holders in the center console; and a bigger glove compartment. Sitting in the styling buck, we found notably increased leg and knee room and a just-right seating position. The steering wheel felt absolutely perfect to our palms-and to every joint of every finger, for that matter. The soft top, available in cloth or vinyl, has a center latch system rather than the current dual latches, for one-handed operation, and it is still easy to retract and pull up while you’re sitting in the car. A detachable hard top with a wide rear window that wraps around the sides also will be available. Don’t be surprised if you see Mazda’s new roadster described more often as the MX-5 than as the Miata. Miata was solely a U.S. brand name, and Mazda officially is dropping the moniker for the third generation. However, Mazda North American Operations is not so naive as to think we Americans are going to give up the name that easily, so they’ll continue to refer to it informally as the Miata, and no one is going to admonish you-or us-for doing the same. 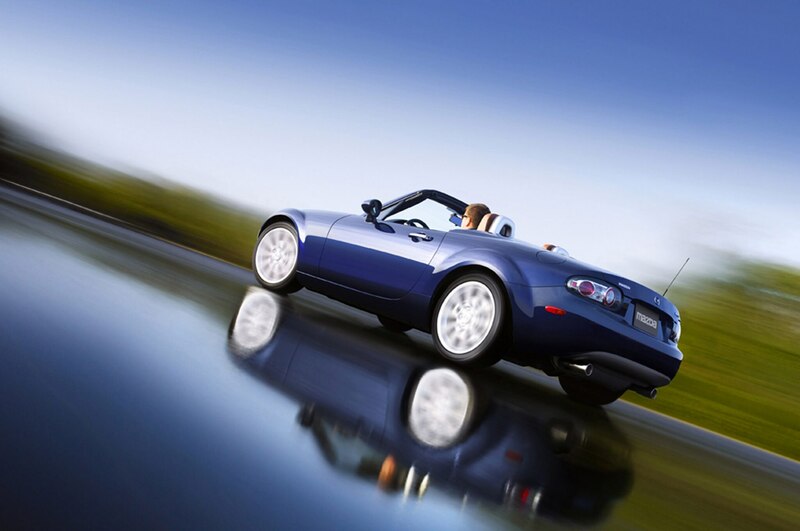 Your first stateside opportunity to see the 2006 Mazda MX-5 Miata in person is at the New York auto show in late March 2005. We get to drive it in June, and sales begin in August or September. 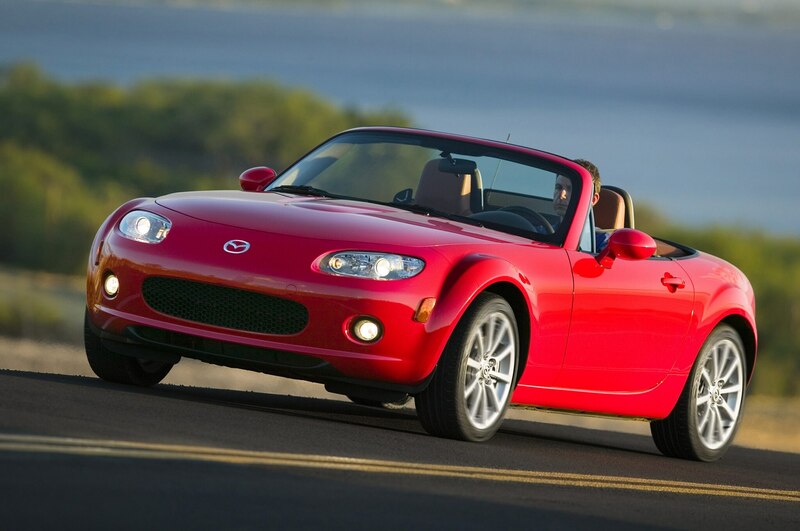 All indications point to a car that will be every bit as good as, and most likely better than, its predecessors, which have found nearly 750,000 buyers since the original Miata debuted in April 1989. Mazda wisely has refined, rather than redefined, a winning formula. It seems promises have been kept. Getting to grips with the third-generation roadster in Hawaii.